Biotinylated Human IGF-II, Fc Tag (IG2-H82F9) is expressed from human 293 cells (HEK293). It contains AA Ala 25 - Glu 91 (Accession # P01344). The protein has a calculated MW of 35.4 kDa. As a result of glycosylation, the protein migrates as 40 kDa under reducing (R) condition, and 66 kDa under non-reducing (NR) condition (SDS-PAGE). 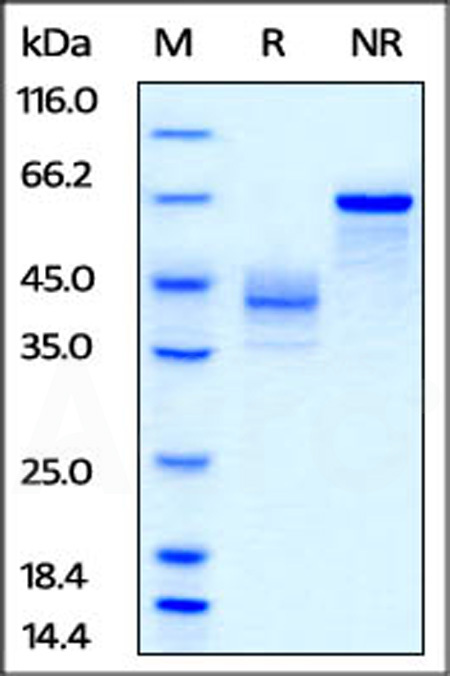 Biotinylated Human IGF-II, Fc Tag on SDS-PAGE under reducing (R) and non-reducing (NR) conditions. The gel was stained overnight with Coomassie Blue. The purity of the protein is greater than 95%. Immobilized Human IGFBP-3, His Tag (Cat. No. 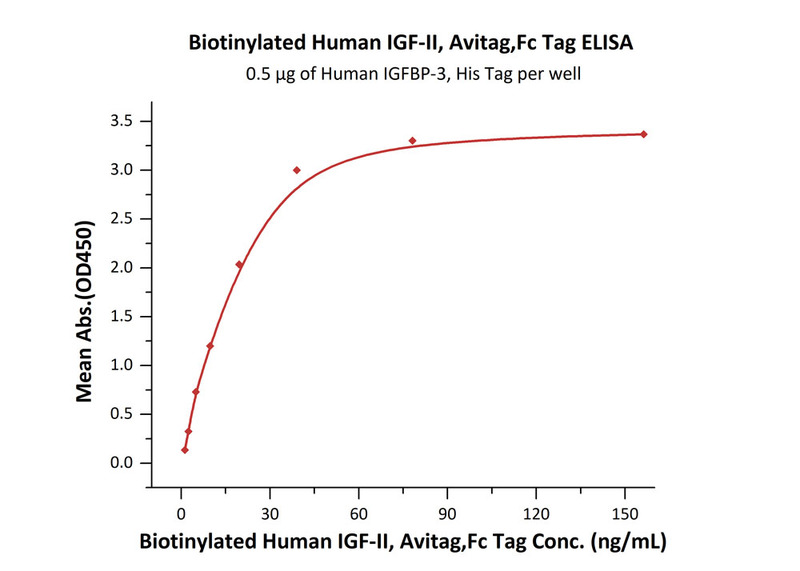 IG3-H5229) at 5 μg/mL (100 μl/well) can bind Biotinylated Human IGF-II, Fc Tag (Cat. No. IG2-H82F9) with a linear range of 0.008-0.1 μg/mL (QC tested). Insulin-like growth factor 2 (IGF-2) is also known as Somatomedin-A, IGF-II, PP9974, and is one of three protein hormones that share structural similarity to insulin. IGF-2 exerts its effects by binding to the IGF-1 receptor. IGF2 may also bind to the IGF-2 receptor (also called the cation-independent mannose 6-phosphate receptor), which acts as a signalling antagonist; that is, to prevent IGF2 responses. The major role of IGF2 is as a growth promoting hormone during gestation. In the process of Folliculogenesis, IGF2 is created by Theca cells to act in an autocrine manner on the theca cells themselves, and in a paracrine manner on Granulosa cells in the ovary. IGF2 promotes granulosa cell proliferation during the follicular phase of the menstrual cycle, acting alongside Follicle Stimulating Hormone (FSH). After ovulation has occurred, IGF-2 promotes progesterone secretion during the luteal phase of the menstrual cycle together with Luteinizing Hormone (LH). Thus, IGF2 acts as a Co-hormone together with both FSH and LH. IGF-2 may play a key role in memory and could potentially be used to treat Alzheimer's Disease. It is sometimes produced in excess in islet cell tumours, causing hypoglycemia. Doege-Potter syndrome is a paraneoplastic syndrome in which hypoglycemia is associated with the presence of one or more non-islet fibrous tumors in the pleural cavity. has been shown to interact with IGFBP3 and Transferrin. (1) MacRae, Fiona , 2011, Daily Mail (London). (2) Balduyck B,et al., 2006, J Thorac Oncol 1 (6): 588–90. (3) Storch, S, et al., 2001, FEBS Lett. (Netherlands) 509 (3): 395–8. (4) Buckway, C K, et al., 2001, J. Clin. Endocrinol. Metab. (United States) 86 (10): 4943–50. (5) Twigg, S M, Baxter R C, 1998, J. Biol. Chem. (UNITED STATES) 273 (11): 6074–9. (6) Firth, S M; Ganeshprasad U, Baxter R C, 1998, J. Biol. Chem. (UNITED STATES) 273 (5): 2631–8.